What happens when you slice par-boiled whole potatoes and grill them? 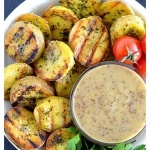 You get these AMAZING Grilled Potatoes with Mustard Vinaigrette. This was a little experiment and I must admit, I couldn’t stop eating them. They are kind of like a more sophisticated version of french fries. But to be completely honest, I would have totally enjoyed these with plain old ketchup! A light brushing of an herb-infused oil makes them crispy on the outside and par-boiling them makes them tender on the inside. Those crisp edges are my favorite part. I chose large Yukon Gold potatoes and I just loved how they turned out. They were the perfect size for grilling (i.e., they don’t fall down between the grates. Hate that!) I served mine alongside these 3 Ingredient Red Bean Burgers (my current obsession). The mustard & vinegar-based sauce has a bit of tang to it. You could very lightly brush the potatoes as I have here, or use it for dipping. Leave out the sauce and your kids will absolutely love these over sized fries dunked in ketchup! You’ll want a pretty hot grill, so get that preheated first. We are going to par-boil the whole, skin-on potato before slicing. It won’t be completely tender, but that’s okay. It will finish cooking on the grill. Depending on the size of the potatoes, this could take anywhere from 8-12 minutes. Remove and allow to cool enough to handle. Slice into 1/2 – 3/4″ slices leaving the skin on. Meanwhile, we are going to make an herb-infused oil. Rosemary, thyme and parsley (or your favorite combination) along with the usual suspects – salt and pepper. I tried chopping the parsley at first but you really need to process this in a blender or food processor. It helps bring everything together. Brush onto one side of the potatoes and place directly onto a hot grill. Brush the other side before flipping. NOTE: The potatoes are more likely to stick if you try to move them around too early. Let them cook and get crispy on one side first. This took me about 12-15 minutes. The first side should be browned, crispy and have nice grill marks. While the potatoes are grilling, combine the sauce/vinaigrette ingredients. I brushed the potatoes immediately as they came off the grill. You can also serve some for dipping on the side. 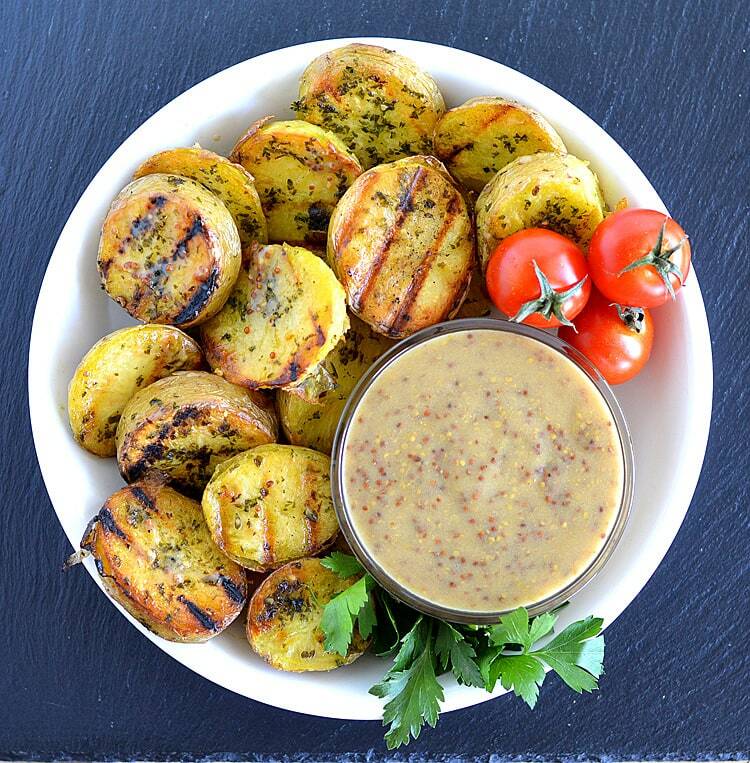 So fire up the grill and make these Grilled Potatoes with Mustard Vinaigrette. It’s too hot to be cooking inside anyway! We are going to par-boil the whole, skin-on potato before slicing. It won’t be completely tender, but that’s okay. It will finish cooking on the grill. Depending on the size of the potatoes, this could take anywhere from 8-12 minutes. Remove and allow to cool enough to handle. Slice into 1/2 – 3/4" slices leaving the skin on. Meanwhile, we are going to make an herb-infused oil. Rosemary, thyme and parsley (or your favorite combination) along with the usual suspects – salt and pepper. I tried chopping the parsley at first but you really need to process this in a blender or food processor. Brush onto one side of the potatoes and place directly onto a hot grill. Brush the other side before flipping. NOTE: The potatoes are more likely to stick if you try to move them around too early. Let them cook and get crispy on one side first. This took me about 12-15 minutes. The first side should be browned, crispy and have nice grill marks. 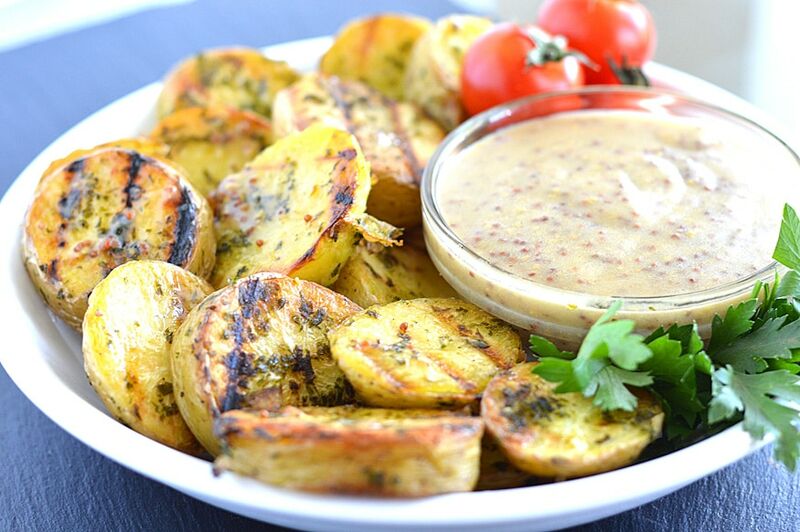 While the potatoes are grilling, combine the dipping sauce ingredients. I brushed the potatoes immediately as they came off the grill. You can also serve some for dipping on the side.